It was with great trepidation that I approached Rise of the Planet of the Apes; I had no wish to see another junky reimagining of a classic property with dodgy CGI apes replacing John Chambers’ legendary makeup from the original series. I also was wary of its apparently Luddite anti-science agenda. However, in a clear case of “monkey see, monkey do,” I decided to check it out anyway, since everybody else was seeing it. And I am glad I did. The greatest advantage Rise of the Planet of the Apes has in its arsenal is that the audience thinks it knows where the movie is going – so the filmmakers do their best to upend expectations, zagging instead of zigging, and cloaking the larger story by distracting viewers with the more intimate, engaging tale of Caesar the intelligent chimpanzee and his handler/father, Will Rodman. 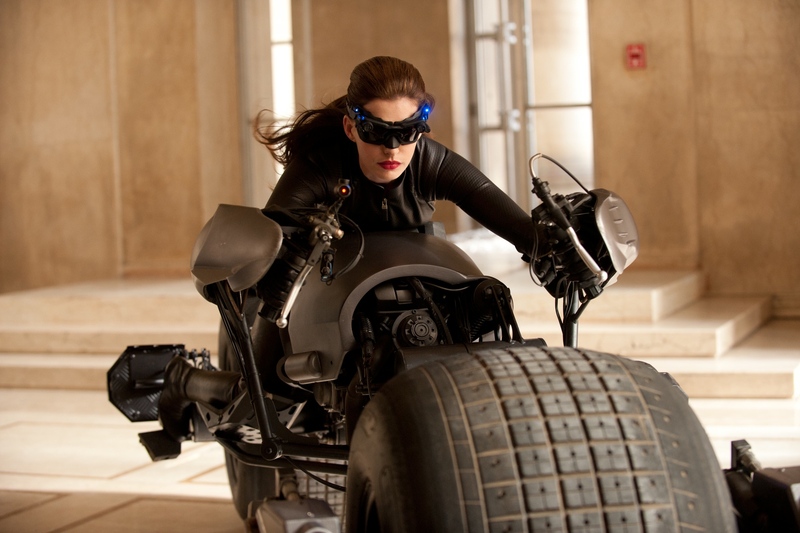 Warner Bros. has released the first official photo of Anne Hathaway as Selina Kyle from the forthcoming The Dark Knight Rises, and I think it’s a great image. The studio has deliberately avoided saying Hathaway is playing Catwoman in favor of always referring to her by her civilian identity, Selina. But everybody knows her nom du crime, and Hathaway outed herself as playing Catwoman months ago. So what do we see here? Selina riding the Batpod. Or, at least, a two-wheeler designed to look very much like Batman’s motorcycle from The Dark Knight. She’s wearing goggles with blue lights, and tight black leather. And her hair is long. That’s all we know about her. Oh, and that she (apparently) has the stones to steal Batman’s ride! That says a lot about her right there. This image is designed to tease – to make you want to see more. And it does its job admirably. Here we go again: Another superhero costume clumsily “adapted” for the big screen with less-than-stellar results – and this time it’s the godfather of all supersuits, the prototypical uniform worn by Superman, the one who started it all! 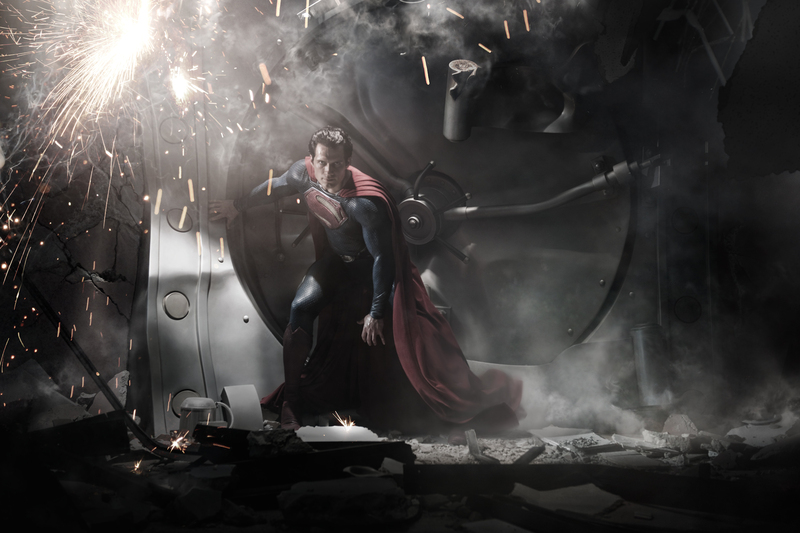 In this first official image from next year’s Man of Steel, we see Henry Cavill portraying Kal-El in a bad mood. Why does Superman’s iconic costume have to be redesigned to look like Spider-Man’s uniform? Those little hexagonal patterns are pointless and distracting. And the shield on his chest? Is its ginormous size a direct rebuke to the more modest “S” that Brandon Routh sported in Superman Returns? The cape looks like thick, heavy drapes slung over his shoulders (but he should have no trouble carrying it). The bulky costume gives me impression that it’s supposed to help protect Supes, which is, of course, a ludicrous thought; Superman doesn’t need body armor. He may need lead to protect him from Kryptonite, but that’s about all. Kal-El isn’t worried about skinning his knee while stopping back robbers. 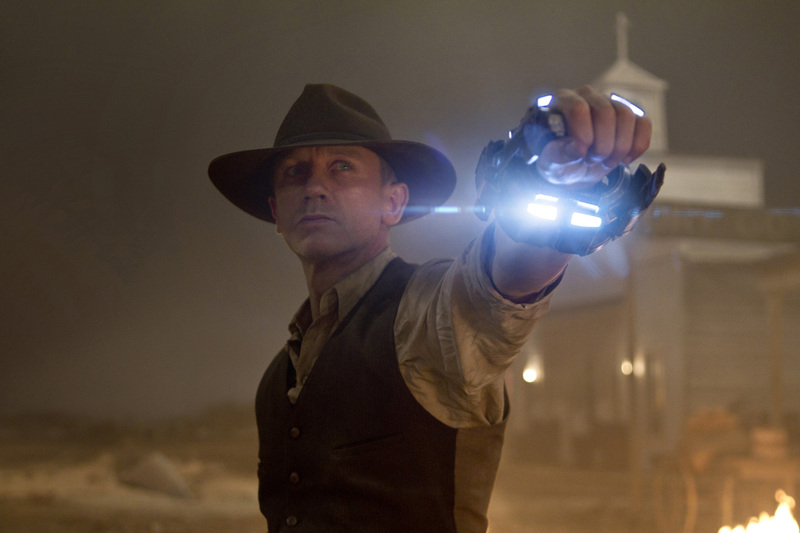 Another summer weekend brings another comic-book adaptation to the big screen, and this week’s Cowboys & Aliens materialized with quite a pedigree: directed by Iron Man and Iron Man 2‘s Jon Favreau, produced by (among others) Brian Grazer and Ron Howard, and executive produced by Steven Spielberg. So how can a movie from that brain trust be so lacking in imagination? After the initial idea of the mash-up, the movie – like its taciturn lead – doesn’t have much to say about either genre. Jake Lonergan (Daniel Craig) awakens in the desert of Arizona in 1873 literally as a man with no name: He has no memory of who he is or how he got there. However, he does have an unfamiliar metal bracelet clamped to his left wrist. At the nearest town, Lonergan attracts the attention of enigmatic beauty Emma (Olivia Wilde), who senses something off about Lonergan and his anachronistic jewelry. Then Sheriff Taggart (Keith Carradine) identifies Lonergan as a wanted outlaw. When Taggart attempts to ship Lonergan out of town along with the ne’r-do-well son of the local cattle baron, the group is confronted by a furious daddy Dolarhyde (Harrison Ford). However, their standoff is interrupted by strange flying machines that kidnap a number of townsfolk and nearly kill the rest – except that Lonergan’s bracelet suddenly reveals itself as an alien weapon capable of shooting down the fighters. Dolarhyde enlists Lonergan and Emma to help him rescue his son and the rest of the kidnap victims from the unearthly menace. 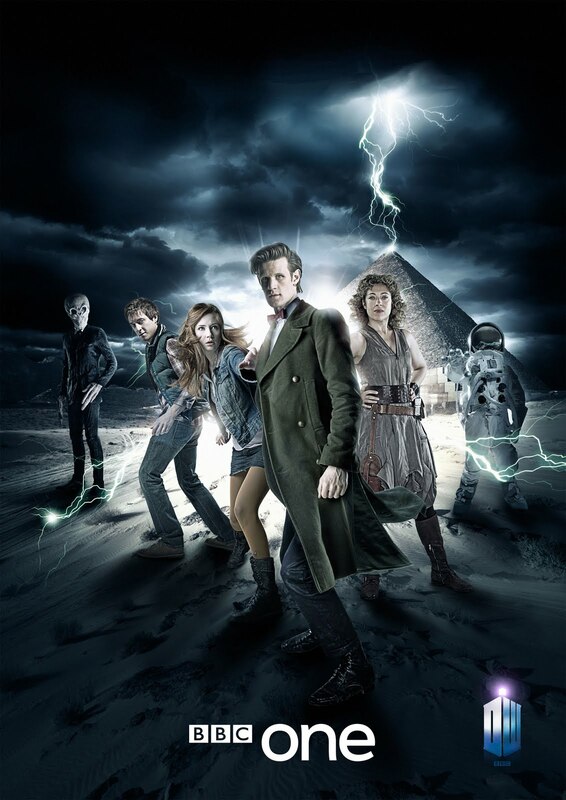 It looks like Matt Smith will get his wish for the Doctor to don a long coat – at least in the promotional poster for the second half of series six of DOCTOR WHO! And what about that pyramid? I think we’ve all heard the rumors about a Cybermen story set in Egypt featuring echoes of “Tomb of the Cybermen.” Perhaps River’s expedition uncovers a group of slumbering metal monsters, and thus we get the return of the “proper” Cybermen from Mondas? I hope so! But then again, perhaps the ancient monolith has something to do with the Silents.